HMD Global has announced that during their upcoming product conference in Taiwan, they will be showing off the Nokia X71 for the very first time. The event is scheduled for April 2 where Nokia 9 PureView will also be launched. The X71 is Nokia’s first phone that sports a punch-hole camera cutout on the front. Interestingly, the phone is also a first for the company to sport a 48MP camera paired with an ultra-wide sensor that has 120-degree field-of-view and a telephoto lens. The cameras are optimized by Zeiss optics and come with that assurance. The X71 is rumored to feature a 6.22-inch display and that it will launch dubbed as Nokia 8.1 Plus in the global market. Other than that, details are scarce about the upcoming camera phone by Nokia. Alongside the Nokia X71, HMD Global will also be announcing their Penta-camera beast, Nokia 9 PureView. It features a 5.99-inch QHD+ (2880 x 1440 pixels) OLED screen topped with Gorilla Glass 5. The display is HDR10 compliant which makes it a great option to consume content on. It is powered by Snapdragon 845 chipset and an octa-core CPU backed by 6GB of RAM and 128GB of storage. 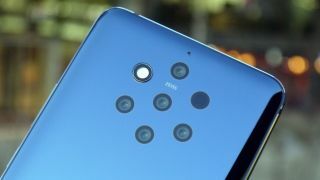 There are five 12MP sensors on the back of the Nokia 9 PureView, out of which two are RGB and three are monochrome, optimized by Zeiss optics. On the front, there’s a 20MP selfie camera. Nokia 9 PureView has a battery capacity measuring 3,320mAh and supports Quick CHarge 3.0 in addition to fast wireless charging via Qi-certified wireless chargers.